This was an amazing spiritual vision experienced by Elisha, one of God’s many prophets. His teacher Elijah had completed his work on Earth and was departing from the physical world and being raised into Heaven. Now, Swedenborg tells us that we are able to see many wonderful things in the spiritual world but these outer things that we perceive always correspond to inner spiritual realities. Hence, what Elisha perceived in his spiritual vision represented what was happening within mind and spirit. It seems that Elijah’s heart was so pure and innocent and his mind was so filled with the Truth or Word of God that he was not required to pass through the world of spirits first like most human beings; instead, Elijah was directly raised into Heaven by the Lord. And, by using the science of correspondences, we are able to understand how this event unfolded. We know that fire corresponds to Love, horses to understanding and chariots to doctrines. A whirlwind is an influx or toroidal vortex of Divine Love. 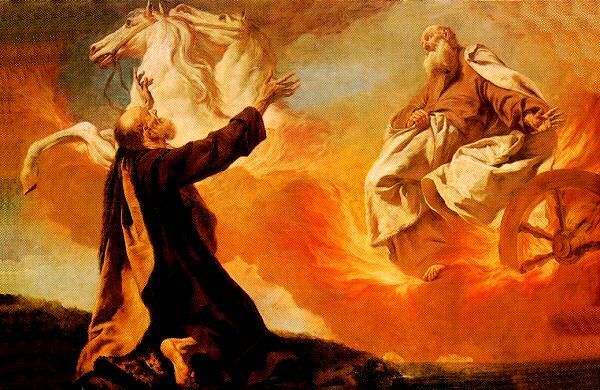 Hence, we discover that due to Elijah’ s understanding (horses) and his love (fire) of Heavenly doctrines(chariot), he was able to be raised directly into Heaven by the Lord (a whirlwind of Love). Now, our clothes correspond to our spiritual intelligence. And, due to Elijah’s elevated state of being, his mantle represented spiritual Truth. Elisha tore his own garments and put on Elijah’s mantle. This means that Elijah passed on his spiritual knowledge, intelligence and power to Elisha. Elisha now had the power of God within his own being and he could continue God’s work on earth as evidenced by his parting of the waters of the Jordan river. And the people around him immediately recognized by Elisha’s actions that he had received the power and spirit of Elijah and that he was now his worthy successor. It is interesting to note the difference between the names “Elijah” and “Elisha” in Hebrew. Elijah or ELIYAHU means “My God is YAHU or YHVH” and Elisha, as in YEHOSHUA or Jesus, means “My God is Salvation.” And if persons in the Bible represent elements of human and Divine Character, we can see how this story is another prophecy of God descending as the Messiah on Earth to save and heal His people. Like God [Father] descended as the Word [the Son] in the world, Elijah’s mantle [Divine Truth] fell from Heaven into the world. Elisha tore the garments which he wore and put on Elijah’s mantle [Divine Truth] like Jesus redeemed and glorified the corrupted humanity which He embodied through His human temptations. And, in fact, like Jesus, Elisha went on to heal many people. Chariots are mentioned in very many places in the Word, yet scarcely anyone knows that matters of doctrine concerning goodness and truth, and also factual knowledge attached to those matters of doctrine, are meant by 'chariots'. The reason for such lack of knowledge is that nothing spiritual, only what is natural and historical, enters their thinking when 'a chariot' is mentioned, or similarly when the horses in front of a chariot are mentioned. But in the Word the powers of the understanding are meant by 'horses', and therefore 'a chariot' means matters of doctrine and associated factual knowledge. It has become clear to me from the chariots which I have seen so many times in the next life that 'chariots' means the matters of doctrine and also the factual knowledge which the Church possesses. There is also a place over on the right, around the lower earth, where chariots and horses, together with rows of stables, appear. In that place people who in the world were considered learned, and who thought that life was the end in view of learning, stroll and converse with one another. The origin of such chariots and horses seen by them lies with the angels in higher heavens; when these angels' conversation turns to intellectual concepts, and to matters of doctrine and to known facts, those chariots and horses are seen by the spirits around the lower earth. Behold, a chariot of fire and horses of fire came between them, and Elijah went up in a whirlwind into heaven; Elisha saw this and cried out, My father, my father, the chariot of Israel and its horsemen. 2 Kings 2:11, 12. When Elisha was sick with the illness from which he died, Joash the king of Israel came down to him and wept before his face and said, My father, my father, the chariot of Israel and its horsemen. 2 Kings 13:14. A mountain full of horses and chariots of fire. 2 Kings 6:17. You will be filled at My table with horse and chariot, with mighty man and every man of war. Thus will I bring My glory to the nations. Ezek. 39:20, 11; Rev. 19:18. This refers to the Lord's Coming. Anyone can see that here 'horse and chariot' does not mean horse and chariot, for people are not going to be filled with these at the Lord's table but with such things as are meant spiritually by 'horse and chariot', which are intellectual concepts and matters of doctrine regarding what is good and true. The chariots of God are myriad on myriad,* thousands of peacemakers; the Lord is within them, Sinai is within the sanctuary. Ps. 68:17. Jehovah covers Himself with light as with a garment; He stretches out the heavens like a curtain, laying the beams for His upper chambers** on the waters; He makes the clouds His chariots; He walks on the wings of the wind. Ps 104:2, 3. The prophecy of the wilderness of the sea. Thus said the Lord to me, Set a watchman; let him announce what he sees. He therefore saw a chariot, a pair of horsemen, a chariot of asses, a chariot of camels, and he listened diligently, with great care. For a lion cried out on the watchtower, O Lord, I am standing continually during the daytime, and at my post I have been set every night. Now behold, a chariot of men, a pair of horsemen. And he said, Fallen, fallen has Babylon. Isa. 21:1, 6-9. At that time they will bring all your brothers in all nations as an offering to Jehovah, on horses, and in chariots, and in covered waggons, and on mules, and on fast runners, to My holy mountain, Jerusalem. Isa. 66:20. Behold, Jehovah will come in fire, and His chariots will be like a whirlwind. Isa. 66:15. Has Jehovah been displeased with the rivers? Has Your anger turned against the rivers, has Your wrath turned against the sea, that You ride on Your horses, Your chariots being salvation? Hab. 3:8. I lifted up my eyes and saw, and behold, four chariots coming out from between two mountains; but the mountains were mountains of bronze. The horses coupled to the first chariot were reddish, the horses coupled to the second chariot were black, the horses coupled to the third chariot were white, and the horses coupled to the fourth chariot were mottled. Zech. 6:1-3. There will enter through the gates of this city kings and princes seated on the throne of David, riding in chariots and on horses, they and their princes, the men of Judah and the inhabitants of Jerusalem. And this city will be inhabited for ever. Jer. 17:25; 12:4. 'The city that will be inhabited for ever' is not Jerusalem but the Lord's Church meant by 'Jerusalem'. The kings who will enter through the gates of that city are not kings but truths known to the Church. Thus 'princes' are not princes but the first and foremost aspects of truth. Those 'seated on the throne of David' are Divine Truths which go forth from the Lord; and those 'riding in chariots and on horses' are consequently intellectual concepts and matters of doctrine. Chariots are also mentioned many times in historical descriptions in the Word; and since historical events are representative of, and the words used to describe them mean, the kinds of things that exist in the Lord's kingdom and in the Church, 'chariots' have a similar meaning there also. Woe to those who go down into Egypt for help and rely on horses and trust in chariots because they are many, and on horsemen because they are extremely strong, but do not look to the Holy One of Israel. 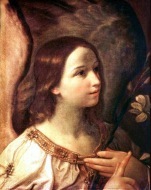 Isa. 31:1. By the hand of your servants you have spoken ill of the Lord and have said, By the multitude of my chariots I have gone up [to] the height of the mountains, the sides of Lebanon, where I will cut down the tallness of its cedars, the choice of its fir trees. Isa. 37:24. Behold, waters rising out of the north which will become a deluging stream, and they will deluge the land and all that fills it, the city and those who dwell in it. And every inhabitant of the land will wail at the sound of the beat of the hoofs of the horses his mighty ones, at the noise of his chariot, the rumble of its wheels. Jer. 47:2, 3. By reason of the abundance of his horses their dust will cover you; by reason of the noise of horsemen, and wheels, and chariots, your walls will be shaken, when he comes into your gates, like the entry into a city that has been breached. By means of the hoofs of his horses he will trample all your streets. Ezek. 26:10, 11. I will overthrow the throne of kingdoms, and I will destroy the strength of the kingdoms of the nations. I will also overthrow the chariots and those riding in them; the horses and their riders will come down. Hagg. 2:22. I will cut off the chariot from Ephraim, and the horse from Jerusalem, I will cut off the battle bow. On the other hand He will speak peace to the nations. Zech. 9:10. Egypt comes up like the river, like the rivers his waters are tossed about. For he said, I will go up, I will cover the earth, I will destroy the city and those who dwell in it. Go up, O horses; rage, O chariots. Jer. 46:8, 9.